Update 1.15.0 is now live. We hope you enjoy the many changes around the site.  Avatars - Housekeeping: The villager Alli in City Folk and Maelle in Wild World were not available in the avatars section even though we had images of them. So, both were made available. Also for City Folk, Jeremiah was duplicated. So, one was removed. Additionally, all Wild World monkeys weren't in the avatar section. These have been created and added.  Boards - Tidying Appearance: With Dream Codes now appearing below avatars, and that section having to be widened, other visual aspects of boards and posts have been tidied and tweaked.  Emotes - Special Event: Emotes were added for a particular event in September.  Fix - Left Sidebar: Adding a board with a long name to the My Favorite Boards section of the left sidebar used to skew the appearance of the list. This has been corrected.  Fix - Word Missing in Hover Message: On the Site Features Queue board, the icons to the left of the thread titles show messages when hovering over the icons. One of the messages was missing a word. This has been fixed.  Graphics - Clock: Since various graphics and images have been spruced up, the clock showing the time has also been tidied up.  Graphics - Home Page: The appearance of the Home Page has improved. The AC games are in a colored box and therefore more defined, plus sharp lines were rounded off.  Graphics - Spring & Summer: The ACC Spring and Summer backgrounds were the same. This meant that the green grass background was displayed for six months of the year. It was decided to have a separate Spring and Summer background and two brand new ones were created. You will see the new Summer background today.  Graphics - Winter & Fall: While updating the Spring and Summer backgrounds, the Fall and Winter ones were done too. You will see the new Fall background tomorrow. Alongside the background change, the borders were changed too.  Graphics - Updated ACC Logo: Since we've got new seasonal themes and other refreshed graphics, the ACC Logo was also updated.  Home Page - Updated Animal Crossing Information: Information was added to the Home Page for Happy Home Designer, amiibo Festival, Welcome amiibo, and amiibo Cards. Also, links to various boards and guides were added.  Graphics - Updated New Leaf Boxart: The art image for the New Leaf game box was the pre-release image, and was on the Home Page and on the New Leaf guides page. It has now been updated.  Icons - Site Features Queue: The Site Features Queue board is a place where we list all features that Staff are discussing, working on, have implemented or rejected. Each thread is at a different stage of completion, and this is shown by different coloured light bulb icons next to each thread. Only certain threads, with particular coloured light bulb icons, can be posted on by Members if they want to contribute to the feature. However, for colour-blind Members, it's not easy to distinguish which threads can be posted on as all threads have the same shape of icon next to them. We've now changed the shapes and types of icons so that it's easier for everyone to see which discussions they can be involved in.  Log In - Help Link: Occasionally, some Members have trouble logging in. The "Forgot Password" link isn't always helpful as the password isn't sometimes sent. So, a new link has been added for Members to be able to email Modmins. The response won't be as immediate as the "Forgot Password" system, but a Modmin will at least be able to produce a Temporary Password and email it to the Member. 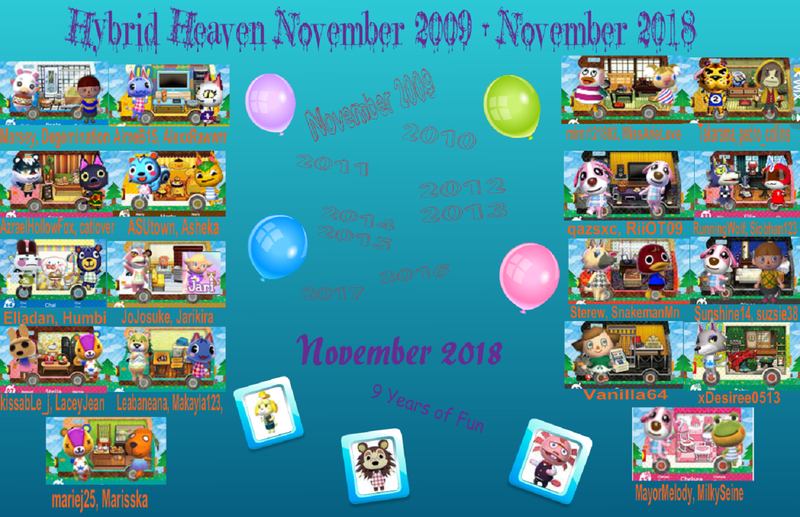  My Towns - Animal Residents: When viewing another Member's page for My Towns, clicking on View Residents led to a page showing GameCube versions of the villagers. Since the avatar section of ACC contains the correct images for villagers in all of the AC games, the View Residents link will now show the avatar images.  My Towns - Navigation: The My Towns page can be quite confusing. It's probably better to redesign this page for ACC 2.0, but for now a few things were added to make the page more user-friendly.  My Towns - Dream Codes: Dream Codes can now be posted freely around the site, but if you don't wish to keep reposting your code you can enter it into the My Towns section of ACC. This can be accessed via the left sidebar in the section called My ACC. If you choose to then show a character from that town as a default character in the My Characters section, your Dream Code will then always appear in all of your posts in the section below your avatar.  New Members - Warning of Username Character Limit: When signing up, New Members sometimes use long usernames and believe they have successfully signed up to ACC. However, any username longer than 15 characters gets truncated, resulting in some unhappy Members. We've now installed a warning message on the sign-up page to inform people of the 15 character limit.  Posts - New Layout: In order to fit Dream Codes below avatars in posts, the area needed to be resized and the appearance slightly altered.  Staff - Dev Page: The Developer Page needed more specific and up-to-date information to attract more volunteer Developers to help us with ACC 2.0.  Threads - Site Features Queue: The Site Features Queue many pages and it is hard to view or search for certain threads. As with other boards, the column titles can be used to sort the threads into a particular order. However, with the SFQ board, the threads also have a status to show Members the stage of discussion or development for features. Since the status of threads on this board is pivotal for its use, Members will now also be able to sort threads according to status.  Threads - Skip to First or Last Page: Some Members use ACC frequently on a mobile device. The feature to have an option to skip to the first or last page of a thread will make it easier than to use the drop down page selection on a mobile device. Please post here if you have any questions or encounter any issues with this update. Please note, browsers often save local copies of images and other resources to improve loading times, known as caching. As we've updated many resources that may be cached, you might experience odd effects as your browser is still using the old version from the cache. If something doesn't look correct, press Ctrl + F5 to force your browser to ignore the cache and load the new resources. If that still doesn't fix the problem, please post about it here and we'll look into it. No need to apologise. That happened to me too! It was interesting and I was tempted to leave it as it was, but then decided to clear my cache. Actually, avatars are doing that for me, too. How do I fix it? but what happens when i'm finally set free? I'm having the same issue. I tried clearing my cache but it has been to no avail. If you're using Chrome, then it tends to be really clingy with cached resources. Press Ctrl + F5 to reload the page and force it to ignore the cache. I use Explorer, don't tend to bother with Chrome. Any suggestions? I guess the devs have been thinking outside the box with these updates, quite literally it seems with the avatars. For Internet Explorer, type CTRL+SHIFT+DELETE, then in the popup, uncheck everything except "Temporary Internet files and Website files". This is on IE 11 (on Windows 10) for me; if the above steps don't work for you, reply back with your operating system & version of browser (if known) and we will check for you. Still not working. I'm using Windows 8 on a HP laptop if that's any help? I've got the same issue with Chrome, but on my phone. I'm currently using a library computer and it's fine, but last I checked on my phone, the two avatar images for everyone but modmins have been separated as mentioned before, and I couldn't find a way to clear the cache. Never mind, I just had to clear my phone's cache. There's your solution, smartphone users. I'm having a few issues with the site taking a while to load, or it loads really slowly while going around since the update. It took me a good few minutes to be able to sign on this morning. It keeps coming up that the site isn't responding. Yesterday, with different internet, different device, it was telling me there was a problem with the page and the Administrator would be told, (or something similar) on trying to sign on. My internet was fine with loading other sites.